Dagwood’s Sandwich Shoppe, Kennesaw GA (CLOSED) – Marie, Let's Eat! It won’t be long, I fear, before blogs like this will be the only proof that this small chain ever existed. The little Dagwood’s empire has already crumbled and collapsed, leaving just a scattered handful of franchises available. 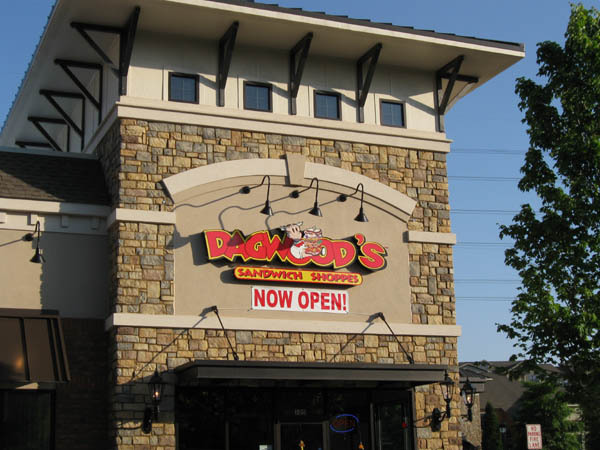 One of them is nearby in Kennesaw and serves up one of the most amazing sandwiches you can find, but nobody confidently predicts that a new generation will enjoy it. Like many of you, I first heard of the chain thanks to some targeted Google keyword sponsored links in my gmail. For a while in 2006, it seemed like every time I received an email with the word “comics” in it, Dagwood’s Sandwich Shoppe popped up on the side. Eventually I got curious enough to check it out, and was delighted by the incredible cuteness of what I saw. Apparently, Dean Young, the current writer of the King Features comic strip Blondie, which was created by his father in 1930, decided to fulfill a lifetime dream of a chain of sandwich shoppes making wild meals just like the ones that Dagwood Bumstead would concoct. I stress that “incredible cuteness” only goes so far. I do not believe that I have looked forward to reading a new installment of Blondie since I was ten, and don’t expect to again until I’m in a retirement home. I admit some archaeological curiosity about what the strip might have been like in 1930, when Blondie was a carefree, rich flapper girl with daddy issues. What I’ve heard sounds preferable to the suburban mediocrity that King Features has been inflicting upon us for more than forty years. In 2006, the chain had not left Florida. Throughout 2007, they started popping up in the midwest, South Carolina and Texas, and one arrived in Suwanee, Georgia. Surprisingly, in the spring of 2008, one opened near us, at the intersection of Barrett Parkway and Ridenour. I would never have known this had I not, by chance, chosen to come back that way from the far end of Whitlock, just to have something different to look at on my way. This amazing little secret has somehow, despite the ridiculously awful location, unbelievably awful hours (they usually close at 7) and occasionally awful teenage staff in place when we’ve visited, managed to stay open for two years. How much longer is anybody’s guess. If you try looking up simply Dagwood’s on Google, you’ll first get a half-dozen unrelated restaurants from all across the country who have appropriated the name from the comic strip. If you search for Dagwood’s Sandwich Shoppe, you’ll find a completely different story: tales of franchisees suing the owners, closed stores, and websites, once geared to franchises’ regions, which have defaulted to Go Daddy placeholder pages. It would appear that the Florida stores are gone, leaving the one here in Kennesaw and a handful in Indiana and Kentucky. Possibly one in Springfield, Missouri. In fact, when I first visited the local store in May of 2008, I was unaware that things were already falling apart. That very month in the magazine Franchise Times, there appeared a quite remarkable article by Jonathan Maze about how the many investors and franchises were lining up their lawyers. 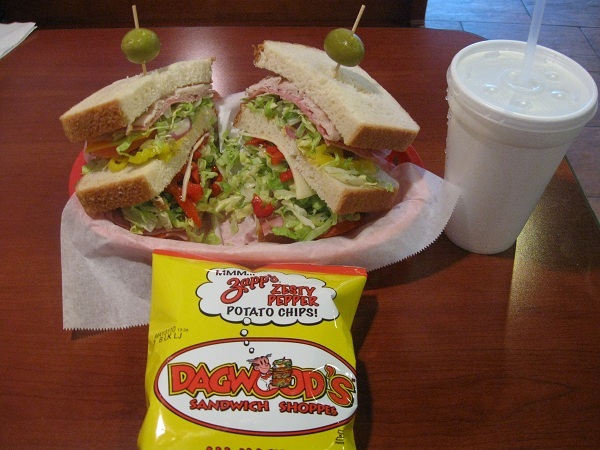 That Dagwood’s exists anywhere at all right now is frankly amazing. So Marie and our daughter and I went to supper here last week and the stink of failure was so heavy that I felt I needed to order their trademark Dagwood sandwich, suspecting that I won’t have many more chances. The bad vibe was so heavy that when we left, I forgot and neglected to snap a picture of the building for the blog, necessitating this photo from our first visit, two years previously. Over those two years, the quality of the food has not altered a jot. These are, despite everything else in this entry, leagues superior to any other sandwich chain, except Jersey Mike’s, which I completely love. Why anybody would stop at a Jimmy John’s, a Subway or a Quizno’s over Dagwood’s I couldn’t tell you. Food-wise, Dagwood’s is genuinely terrific, and the Dagwood itself is, as pictured, a giant jawbreaker of a meal, a real treat that you can barely finish. The restaurants offer Zapp’s brand chips on the side, and even have packs of their cracked pepper and sea salt flavor repackaged as Dagwood’s Zesty Pepper, so I suppose that the good people at Zapp’s, at least, were sold on this chain’s solvency. But everything else about this place is increasingly underwhelming. At least the teens who were blaring their music at maximum volume a few months ago have gone, but the ones who replaced them were in a real hurry to get out of there as quickly as possible, and had stacked the chairs in the window shortly after six so they could clean the floors. While we were eating, two different parties drove up, saw the stacked chairs, backed out and drove away, concluding that they were closed. One of Dagwood’s greatest follies is that about a quarter of its counter space is given over to Blondie merchandise, despite the indisputable fact that nobody between the ages of ten and seventy can be said to be a Blondie collector. Bafflingly, there is a single collected edition of the comic strip in print, but they didn’t sell that in the restaurant, just glasses and tchotchkes. Well, the merchandise shelf is, as expected, collecting dust, and the flat-screen TV which was set up to show Blondie comics, panel-by-panel, on a loop has been switched off for months. The food’s still good. It’s excellent. But nobody seriously expects it to still be available this time next year. If you’d like to go, phone first. Posted on April 2, 2010 July 29, 2017 by Grant G.Posted in atlanta, georgia, goodbye, regional chains, sandwichesTagged atlanta, closed!, georgia, kennesaw, regional chains, sandwiches.